Tampa Bay Lightning have just been on the wrong end of a 4-2 scoreline but when we speak by phone, the National Hockey League team’s CFO and head of data analytics Rob Canton isn’t crying into his beer about this setback for the Bolts or looking back. He’s following the old rule, coined by legendary player Wayne Gretzky, which says it’s better to skate to where the puck is going rather than where it has come from. For a coach that means moving onto the next game. For Canton it means using data analytics to ensure fans get the most out of their experience at games. Canton readily admits that the sports sector has not always been a leader in tech. “Other organisations have done more: airlines, retailers and others have been more cutting-edge but we’re catching up,” he says. Canton began working with Tibco and its Spotfire data analysis tool as well as Syntelli Solutions about a year ago as part of an effort to gain access to fast, actionable information about ticket sales, CRM, point-of-sale income, even mentions on social media, and all integrated with mobile devices. 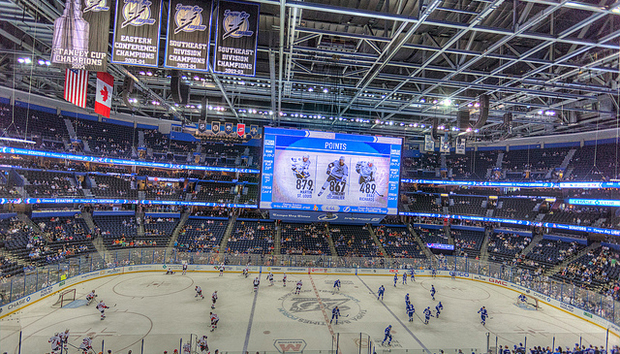 Today, he says, staff can even create their own, near-instant customised reports and Canton’s team gets to customise offers down to individual fans at hockey games as well as the concerts, ice skating and other events that take place in its Amalie Arena home. “We have a real-time understanding of where we stand with reference to ticket sales, we can tie in sales promotions, get higher yields and benefit from dynamic pricing,” Canton enthuses. To a large retailer this will all be familiar, and even old hat, but Tampa has become more daring with its cross-selling. One example: the team has begun embedding an RFID radio chip in the replica shirts given free to season ticket holders. When they go to buy food, drinks or goods, the tag is immediately recognised by the in-stadium point-of-sale systems and a discount is applied. Fans can opt out but, so long as permissions are granted, these sorts of loyalty reward schemes point the way forward for teams that want to make the experience for fans better. Another offer sees fans who have downloaded a mobile app receive alerts for discounts and promotions via smart beacon technology, for example on deals at the World of Beer franchise (the craft beer store/bar chain had its first opening in Tampa). Tampa can also upgrade seats of fans when availability allows and Canton says there’s potential for partners like car dealers, banks or insurance sellers to take that loyalty scheme out of the stadium too. Much of this is applicable to other sports too but Canton says hockey, which draws smaller TV audiences than American football, basketball or baseball and much smaller in-person attendances than the first two, is a particularly good fit. This even extends to keeping one quadrant of the stadium sponsor-free – the “social quad” with TV, big screens, automatic check-in and live tweets. Canton says it’s only “a matter of time” before more ways to entertain and inform kick in and speaks enthusiastically about wristbands that are illuminated in the team colours and other tricks taken from music gigs. Whatever happens on the ice, he says, teams need to take advantage of new technologies that keep big fans loyal and attract new followers.